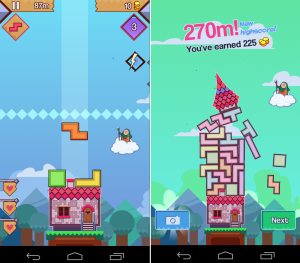 99 Bricks Wizard Academy is a game that offers an interesting mixture of magic, physics and pure tetris on a simple but effective idea. The objective of the game is to build towers as high as possible, using the classic tetris pieces. To achieve this, we need not only move and rotate the pieces to fit them but also fight the gravity. Pieces can move horizontally by half-steps, so that sometimes they are slightly displaced. When the tower gets bigger, the weight builds up and the pieces start to move and bend, following the basic laws of physics. There is no framework to hold the pieces in place, so they can fall by the sides, or that the tower can slowly get deformed, missing some parts when they simply fall down by the sides. The tower ends when we lost a maximum of 3 pieces. To further complicate the mission, we must deal with rival wizards who attack us, testing our skills. Thus, some wizards will send us some giant piece that does not fit at all with the others, while others accelerate the speed of the falling pieces. We will try to overcome the challenge and keep the tower standing despite the odds. With each new tower we unlock, we will also get a new spell. These spells help us with a few tricks, such as removing the last piece we have placed or freezing some piece at a given site, so that we can stabilize the tower or expand it from its base. When we start the game, we find a tower base from which to start building. We will need to periodically overcome challenges such as reaching a minimum height, place a minimum of parts or survive an attack from another wizard. Once we succeed in some of these challenges, we can unlock the next tower, allowing us to build on another base and giving us a new spell and more objectives to move forward. The game provides us more or less coins depending on the height we manage to obtain with the tower. 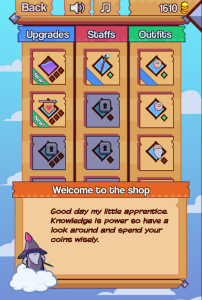 We can change these coins for different gadgets and costumes to characterize our wizard. The controls are simple. With a touch we rotate the pieces, whereas if we drag them sideways, we can move the piece by half steps. Dragging down we can lower the piece faster. Overall, the controls are easy and effective, although when the speed increases, sometimes a piece rotates when we are trying to move it, and it just doesn’t fit at all, provoking an odd mess in our carefully planned tower structure. 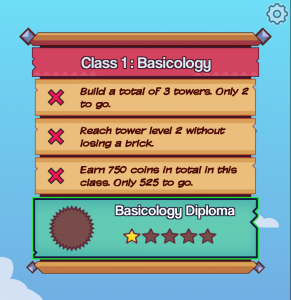 99 Bricks Wizard Academy is available for iOS and Android. Interestingly, it can be found in the App Store with a price of 2.69 €, while it’s free on the Google Play.